A farmer who shot a convicted burglar he thought was stealing diesel from his farm cried outside court today after a jury took just 24 minutes to clear him of GBH. Father-of-three Kenneth Hugill, 83, who had two hip replacements and a heart-bypass operation, was arrested, finger printed and forced to fund his own £30,000 defence after he shot Richard Stables, 44, in the foot outside his isolated farmhouse at Wilberfoss, near York. Mr Hugill shook the hand of his solicitor and wept outside court briefly after a jury at Hull Crown Court cleared him of causing grievous bodily harm. Today his family revealed that following the incident their home was surrounded by armed police and a helicopter who believed they were holding a hostage more than 15 hours after the shooting. The family criticised both the Police and the Crown Prosecution Service for their decision to prosecute an 83-year-old man defending his home. Speaking outside the court, Mr Hugill said: 'I'm very, very pleased. It's marvellous. 'We thought I shouldn't have been prosecuted right from the start, I didn't feel it was justified at the time. Mr Hugill told the court yesterday that he was 'petrified' when the Land Rover 'revved up' without lights on and set off towards him. He fired two shots - one towards the side of the vehicle and another in the air to frighten the occupants away. Richard Stables, a convicted burglar, was hit in the foot and driven straight to hospital by his friend Adrian Barron, a seasoned criminal with convictions for burglary and violence. Mr Stables suffered serious injuries but survived and gave evidence as a prosecution witness. The terrified farmer, who walks with a crutch and has never previously been in trouble with the law, ended up being charged with grievous bodily harm and put on trial at Hull Crown Court. Humberside Police currently are in possession of his gun and it is unclear if he will get it back. Concerning his licence, Judge David Tremberg told the court that it was up to the chief constable to look at the 'renewal' of Mr Hugill's licence. It is not known if Mr Hugill's licence will be taken away from him. Yesterday he hobbled to the witness box to recall the early hours of November 13, 2015. He was asleep with wife Sheila, 78, at the family farm in Wilberfoss, East Yorkshire, where he has lived and worked for almost his entire life, when he noticed a light outside as he returned from the bathroom at around 2am. 'I saw it appear again and thought it was somebody with a flashlight, but it was so black dark I couldn't see anything,' he said. Hugill spoke to his wife, got dressed, put on his hat and went downstairs in the dark. He told police they didn't get electricity until 1954 so he could find his way around without lights. He went into the yard after taking the shotgun - given to him as a 21st birthday present by his parents - and loading it with two cartridges. The farmer said he was startled by the sound of the Land Rover's engine and had little time to react. 'I stood still and practically immediately heard the engine, very, very loud. I was petrified for a second or two and thought it was coming at me,' he said. Hugill said the closest he got to the car was 12 to 15ft and he never saw anyone in it. A second shot was fired 'straight up' as the car drove away to deter the occupants from returning, the court heard. Once back inside the farmhouse he phoned his son who lives nearby, and the son called police, although they did not come out that night. 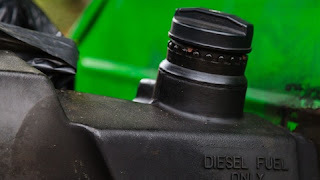 The court heard the men may have been on the site to steal diesel from tanks near the farmhouse and a lock had been 'tampered with'. Christopher Dunn, prosecuting, told the jury the issue was 'whether it was reasonable for Mr Hugill to act in the way he did'. He said the Crown's case was that the farmer fired the gun 'recklessly' and 'without shouting' or calling the police first. Yesterday Stables, who uses a wheelchair to get about because of his injuries, claimed to be 'lamping' - hunting for rabbits by torchlight - with a friend and his dog on the night of the incident. He said they were lost on a country road and pulled up near the defendant's farmhouse to clean up a mess the lurcher dog had made inside their Land Rover. Mr Stables, 44, told the court he may have pointed the 'lamp' at the farmhouse window by accident but had no idea diesel tanks were nearby. He told the jury he was putting the dog back into the car when he was shot in the foot without warning. 'As I went to shut the door I saw a figure appear. No words were spoken. Whoever was stood there fired a gun that hit my foot,' he said. Mr Stables said he used a rope for a tourniquet and went to York Hospital's accident and emergency unit, where he was dropped off by his friend Barron, 40. The injured man gave three different versions of how he suffered his shotgun injuries before eventually admitting a farmer shot him. The court heard Mr Stables had a criminal history with convictions for burglary, theft and possession of an offensive weapon. He was also on a police intelligence list as a person active in rural crime after an incident in the Yorkshire Dales where an officer threatened him with CS spray. The defence claimed Stables and Barron were there to steal diesel not hunt for rabbits. Chief Crown Prosecutor for Yorkshire and Humberside Gerry Wareham said today: 'We considered all the evidence in this case extremely carefully, and took full account of the situation Mr Hugill found himself in that evening.